We began day three of our trip with a morning flight from Stockholm to Cologne-Bonn. Though the flight was operated on a Germanwings liveried plane there was a definite sense that the name was not going to be around for much longer, as both the check-in desk and our boarding passes had the name Eurowings. News stories online suggest that this rebranding had been planned for some time, though it seems likely that the change was accelerated by the tragic crash of flight 4U9525 the previous year. The service on board included free drinks and snacks, a nice improvement when compared to our usual airlines, and better yet the flight landed almost twenty minutes ahead of schedule. Our first stop was at a large fairground in Bad Kreuznach, a town located roughly two hours drive from where we'd landed. Though the fair was a short one, lasting just four days, it had nevertheless managed to attract a respectable selection of major attractions, notably the tallest spin ride in the world, Infinity, which had premiered just a few weeks earlier at nearby Pforzheim. There was a security check on the way into the grounds, which is not something I've encountered in Germany before, and it was as thorough as one can be without metal detection equipment. Large bags were being refused entry, much to the consternation of one visitor we saw arriving with a rucksack. 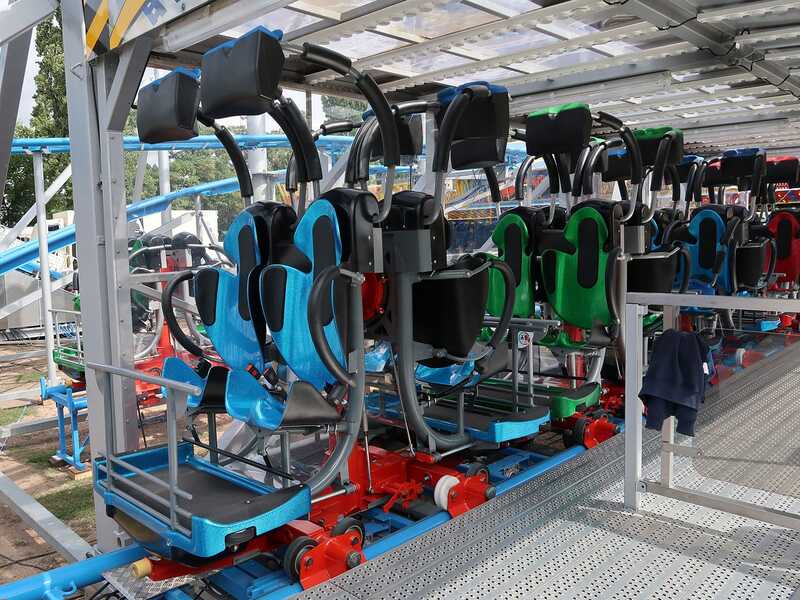 The main target for us was Drifting Coaster (#2211), a completely new Reverchon design with free-swinging seats placed above the track. The ride was originally supposed to launch at the Hamburg Winterdom last year but it was swapped out at the last minute due to unresolved technical issues much to our chagrin. It subsequently took several months to get everything in ordnung, and as a result the public debut ended up being in Luzern, the town where I was evacuated from a hotel in the small hours due to a bomb scare. We decided to buy a single €5 ticket apiece based on the rather mixed reviews we'd read online, reasoning that we could purchase a second lap later if we felt so inclined. Megan's first observation relating to the coaster was to wax lyrical about the blonde French bulldog with red-painted toenails that was guarding one end of the entrance ramp, albeit in an extremely unsuccessful manner as he didn't even growl when we stepped over him. I'll admit to being somewhat more interested in the vehicles, which at first glance looked extremely tall; it was only on closer inspection that much of the height turned out to be from a lap bar lowered from above. There were two seats facing in each direction, and we were directed towards a forward facing pair, though we probably could have ridden in reverse if we'd wanted to. As per usual for a German fair we were dispatched within a femtosecond of the restraints being locked, and we duly rolled through a pair of left turns on to a standard chain lift. The climb gave us a good view of the layout, which I'd describe as long, thin, and unimaginative, consisting of four elements repeated three times without variation: a turn, a drop, a turn, and what I'm going to call a wiggle section where the track had a series of unbanked turns designed to cause swinging. The resultant sideways motion worked fairly well, though it started and stopped without the fluidity seen on the suspended coasters of yesteryear. Unfortunately, the repetitive track layout meant that the overall experience was lacklustre and predictable. I found myself wondering whether the cars might have handled better on a standard Spinning Mouse layout where they were first tested. 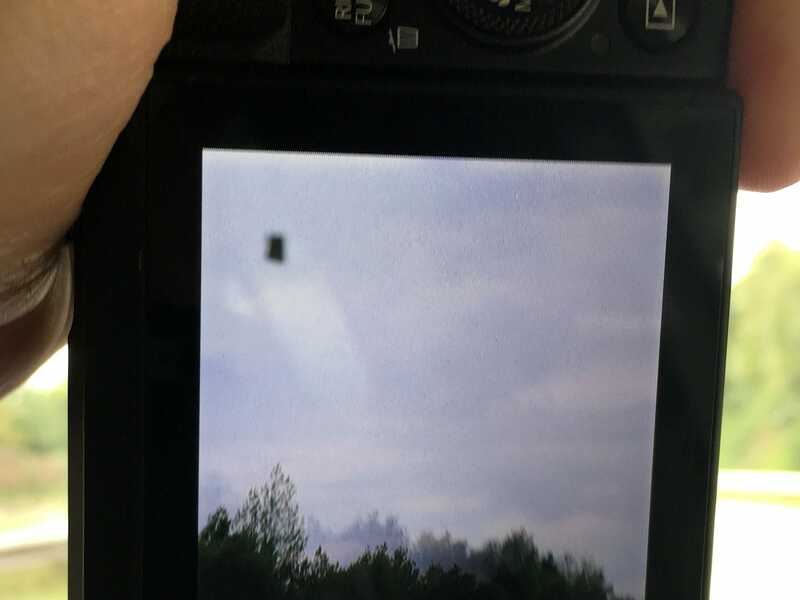 It's also worth recording that there was some noticeable clatter, and while it wasn't severe enough to be painful it was nevertheless a definite downgrade from the usual Reverchon standard. We decided not to ride Tom der Tiger as neither of us needed the credit, but instead decided to splurge €7 on the Europarad wheel for some overview photographs. This proved to be a frustrating experience, as it was only after boarding that it became obvious that my camera had picked up a perfectly square piece of dirt on the corner of the lens (as seen in the Father Ted episode!) that simply would not come off, rendering just about all of my shots useless. Once back at ground level we looked at the glass under a spotlight and discovered that the obstruction was on the inside, leaving me without a working camera. The War Department was kind enough to lend me hers for the balance of our trip, and though the images from it were not as sharp as from mine it was nevertheless a huge improvement over nothing. We found our second fair in a remote village to the east of Cologne. Some two hundred metres of the main street had been lined with temporary market stalls, and a handful of rides had been set up in the various side streets, effectively closing the entire place down. The biggest attractions were grouped together, and included a Huss Breakdance, a Riesenrad, an Inverter, a Musik Express and a small booster-style ride of indeterminate provenance. The village location made for an excellent backdrop for our photographs, and despite the lack of major attractions we both agreed subsequently that it had been our favourite stop of the day. There was a definite air of barrel scraping as we boarded Silbermine (#2279), a double spiral from SBF Rides that remarkably enough had no clatter at all, suggesting that the ride owner knows some ancient and mysterious secret that eludes park operators worldwide. We were given at least ten laps which we shared with a handful of local children, our presence probably tripling the average age of those on board. The fairground at Warendorf is unusual by German standards insofar as it has quite a lot of free parking available, with the nearest spaces just metres away from the rides. The ride prices were exceptionally good value despite this added service, with the most expensive attraction on site costing just three euro. 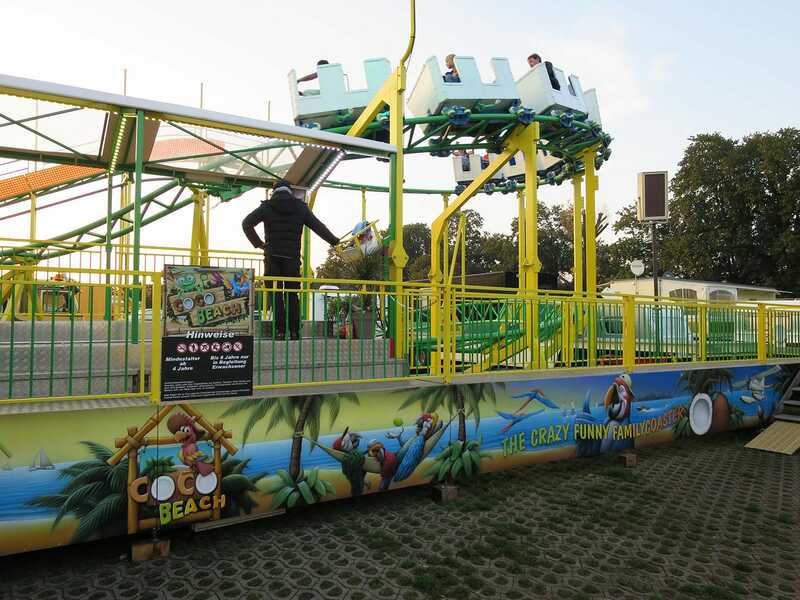 The event was the first for Coco Beach, the latest re-theme of a family coaster that began life in the mid-nineties under the name Holzfäller-Trip. In 2002 it was installed at Magic Park Verden where it spent five seasons, followed by a further eight at Serengeti Park where I caught up with it under the name of Die! Wilde Maus. It looked to us like the rebranding had yet to be fully completed, as the train was an off-white colour and it was very easy to see that the old logo had been painted over. Appearances aside however the tracking was absolutely fine, and the custom layout made for a nice alternative to the ubiquitous Wacky Worm. We were given four laps for our €2.50.